The Red Cross of Gold by Robert Jay. The Third Book in the Montooth Series. Review: It's a normal day in a magic swamp with Montooth the alligator swimming; then disaster strikes. Could you guess what book I'm talking about? 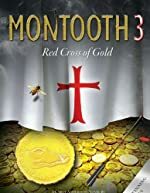 Why, it's Montooth 3 The Red Cross of Gold, an amazing book by Robert Jay and Meghan Christian, the 3rd book in the Montooth series. To begin, this book is filled with adventure--- I think if you like adventure, then you need to read this unique book. This book is a one of a kind story as it has many different scenes in the book. The first section highlights Montooth the alligator and other creatures like the bees and ants. However, as you read the second section of the book, you will find that this book includes humans too. A symbol represents each section so that you know which one you are reading. Furthermore, Montooth 3 is an interesting book because it is not all fiction; it has some facts. For example in the beginning, it contains information about the cold-blooded traits of alligators in the reptile family. The author states, "Unlike mammals with built in air conditioners called perspiration, alligators' bodies take on the temperature surrounding environment." This is not typical of a fiction story, and I liked that touch of reality. The author also does a good job of using terms that are correct for the timeline. In my opinion, any student who enjoys adventure along with interesting nonfiction will find this book perfect! Review written by Joey (6th grade student). We would like to thank Maryglenn McCombs for providing a copy of The Red Cross of Gold for this review. Have you read The Red Cross of Gold? How would you rate it? Joey, I enjoyed reading your review.